Minimiflora means ‘tiny flowered’ and this species lives up to its name. 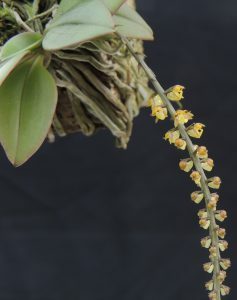 This miniature is found in Thailand, Malaysia and the Philippines and grows as an epiphyte (on trees) or a lithophyte (on rocks) in hot lowland rainforest. 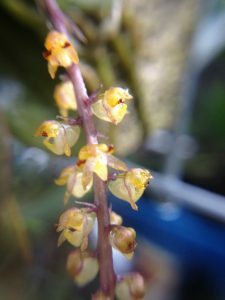 The long lasting tiny flowers are about 1mm across with many produced in succession on a pendulous spikes up to 10cm long. The span across the leaves is just 5cm but our plant seems determined to become a specimen against the odds and is developing additional growths and so eventually for a clump. 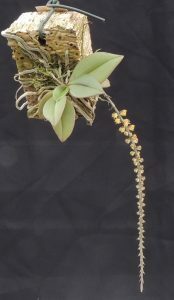 The plant produces lots of roots when grown mounted and we hang it high in our Warm Asia section where it gets a daily watering from the hose.